Many of the new pools going in these days (and even on some remodels), homeowners are opting to add a shallow shelf at one end. These shelves go by several names: Baja Shelf, Tanning Shelf or Sun Shelf. This offers adults a relaxing area to place a lounge chair or kids a shallow section to play on. Even your dog will enjoy a shallow dip in the pool! To make that shelf even more spectacular, bubblers or built-in umbrella sleeves can be added. Special tiling or lighting can also kick things up a notch. Other folks are opting to go with a beach entry. Typically, these are constructed as a gradual decline from 0 to about 12”. Giving you that truly tropical feel of slowing wading into the pool, they can make your pool quite stunning-looking. However, these are a bit more expensive to build than a shelf due to the precise grading needed. In addition, some people report that birds and other animals thoroughly enjoy using these as their personal restrooms. If you are considering either of these, make sure you have enough space in your pool to make this a viable option. After all, you do want to make sure you have enough swim area for your needs. As always consider how you will be using your pool before embarking on a design. Images of you and your family splashing in your new pool swirl through your head. You’ve taken a look at the options and know you want a pool, spa and a small water feature. You have the funds set aside to make this dream a reality. Now it’s time to decide who can bring this to fruition. Choosing the right contractor is an important decision. Depending on your vision, you will be working with the contractor and their company for at least 2-3 months, and potentially much longer. If it’s not someone you like and get along with, that amount of time can seem like an eternity. Ask for a detailed proposal/contract (this will also allow you to compare apples to apples among the bidders). Talk to contractors who specialize in building the type of pool you’re interested in and has the experience to back it up. Check to see if the contractor has the proper licensing and insurance for their business. Determine if the day-to-day workers are employees or if they are subcontractors. Ensure the contractor is an authorized applicator for the materials you’ve chosen. If they have a storefront, visit it to see what the options are for materials. Ensure the contractor will take your job from start to finish—you don’t want them to begin the work and then not see them again for months. Check references for both current and older clients so you know how the clients are treated during the build and also down the road. Ask your friends and neighbors with similar projects if they would recommend the contractor they used. Check with the Better Business Bureau to see if any complaints have been filed. Building your dream pool can be a smooth process or a nightmare experience. Before you dive in headfirst, make sure you have the swimming pool builder that’s right for your project. Huber Pools – In the NEWS! For this month’s blog we are going to revisit and share some of the wonderful media attention we have received over the last few years. Since starting Huber Pools in 2004, Hans Huber has frequently been recognized as a leader in the business community as well as focus on outstanding customer service and craftsmanship. We invite you to check out the articles and media references below. We share these articles as a way of you getting to know us and what others think of us. We want you to rest assured we are a quality company that is here for the long run, ready to serve you over now and in the future. A fast growing company, Huber Pools was the FASTEST growing company in Hawaii in 2007 – check out the article in Pacific Business News http://www.bizjournals.com/pacific/stories/2007/08/13/focus1.html?s=print. 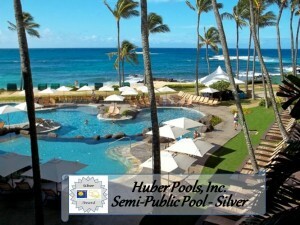 Huber Pools was in the top 50 in 2008 & 2009 as well. It is always nice to be recognized in your local market. 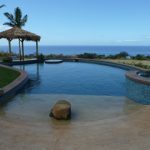 Our Kula homeowners were thrilled that their Huber Pools project was featured in Maui No Ka Oe Magazine http://www.mauimagazine.net/Maui-Magazine/July-August-2008/Cool-Pools/. Then, to be recognized internationally surprised even us! We were pleased to be one of the quality Master Pools Guild (http://www.masterpoolsguild.com/) members featured as “Top Pool Builders” in Ocean magazine http://oceanhomemag.com/?s=Huber last year. We share these articles as a way of you getting to know us and what others think of us. We want you to rest assured we are a quality company that is here for the long run, ready to serve you over now and in the future. We invite your questions and comments – possibly the easiest way to interact with us is by finding us on Facebook http://www.facebook.com/HuberPools , and if you are so inclined “LIKE” us! We won’t spam you, we promise. What you will find are a few posts a week of other completed projects and pool ideas, recommendations and testimonials. You can always give us a call at 808.879.0822, email us Info@huberpools.com, or use the “Contact” web page form. However we hear from you – we look forward to the conversation! Thank you for your interest in Huber Pools! Welcome to the New Huber Pools Blog! In this blog we hope you will find additional information that will be useful to you. We will highlight services, products – especially “green” and energy efficient options, as well as other useful information. Our blog is a new addition to our just re-launched website – HuberPools.com! If you are new to Huber Pools – we invite you to check out our website, where we have a large gallery of photos of completed projects, as well as a list of many of the services we offer. 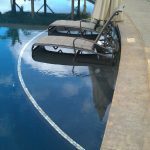 We are Maui’s premier pool builder, proudly building swimming pools in Hawaii since 2004. Please give us a call, or better yet – stop by! Our showroom is open weekdays 8am – 4pm in the Kai Ani Village located at 1367 S. Kihei Rd, Suite 3-110 in Kihei. Kai Ani Village is kitty corner from the Times Supermarket and across the street from St. Theresa’s Catholic Church. We are very proud of our showroom, we make it convenient to see all your options together – real samples, no guessing, no surprises. We even have a complete award winning pool and spa right here at Kai Ani Village so you can check out our quality products and craftsmanship for yourself. And speaking of “award winning”… Huber Pools is proud to be a member of the Master Pools Guild a global network of elite custom pool builders worldwide. Why is our membership in the Master Pools Guild important to you? As a member not only do we share the creative ideas, construction techniques and latest technology by the other members, you can also be confident in professional business practices as we are committed to a Guild Code of Ethics. Each year the Master Pools Guild recognizes the best of the best with Excellence Awards and we are very proud to say that we won three Excellence Awards for 2011. The Master Pools Guild website is full of valuable information about swimming pools and pool builders, a gallery of literally thousands of pool photos and so much more. They even have a YouTube channel where you can view videos about pool design, finishes and the best practices for pool construction. Future blog posts will address topics such as “what to look for in a pool builder”, “what to expect in the pool construction process”, as well as new product information and more. We invite your replies and questions, this is a great forum for discussion and we look forward to the conversation. Thank you for your interest, please check back often!